Twan did a great job presenting our blog at the first edition of Vers Geperst at Club 11 in Amsterdam. A New Media student from Utrecht from the audience contacted us afterwards to talk about the blog and New Media. 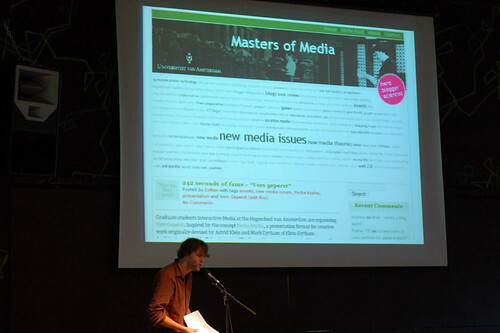 Other great presentations included Michael Stevenson – the Whatever Button and Erik Borra – Open Search. View all pictures from the event. the dot made me look taller by the way, and 12 second slides are tricky but nice. overall a nice evening @11! « Illegal software allowed to be used for just cause? Announcement: new Masters of Media blog!